Over the last few years, Kong Audio have built up an impressive collection of sampled traditional Chinese instruments, which covers strings, woodwind, drums and percussion. Developed with the skills of a professional film composer, this is no 'taste of the Orient', but an authentic set of instrument recordings utilising the talents of superb local players. When I last looked at the Kong Audio range back in 2006 it was already comprehensive, and the individual instruments are still available both separately and in a 20 percent discounted 'Essential China' collection of seven instruments. However, this review is of the latest and greatest version of the complete Chinee Orchestra, now expanded to a massive 23 plug-ins and with an even bigger 25 percent discount. 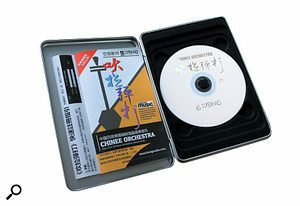 Powered by Kong Audio's own QIN RV 2.0 Engine, Chinee Orchestra is still resolutely PC-only, runs under Windows XP, Vista, 7 and 8, and is supplied in both 32-bit and 64-bit versions. It features nearly 6GB of associated sample data, much of which has been re-recorded at higher fidelity since I last heard it (and which sounds gorgeous!). The new and much simpler-to-use rack-based interface can load up to 16 simultaneous instruments in the one GUI, each with its own MIDI channel and stereo audio output (if you need more than 16 instruments you can open a second instance of the plug-in). Most of the instruments have a little supportive room tone, but there's a very acceptable reverb effect if you need a bigger sound. Other effects include a tempo-sync'ed delay, a pair of resonant filters and even a subtle distortion to add more 'body' to the sound. Multiple instances of these effects can be loaded into the rack as required, each acting as an insert on one of the 16 stereo audio outs, so you can also create 'multis' with different instruments on each MIDI channel, each with its own effects selection and settings. Each instrument also provides a collection of presets covering different playing and legato styles. Other internal features include speed detection (switching between sample groups depending on the time interval between notes), round-robin, release-triggering, delayed triggering, aftertouch, and even Erratic Range Control (which adds human inaccuracies), all of which can be customised and edited in detail if required via the Layers and Keymaps section of the interface. To give you an idea of the versatility on offer, the Guzheng (zither) offers 26 presets covering sustained notes with or without vibrato, tremolo (repeated picking), seven speeds of ornaments, multi-note flourishes, auto pitch-bends, and multi-speed glissandos across a host of keys in both directions.